Need to backup iPhone to macOS Mojave and earlier for the purpose of securely saving the iPhone data on Mac computer? It is a good habit to backup iPhone data to Mac or PC to save anything precious if disaster strikes, for example, when your iPhone is unfortunately stolen, damadged or lost. 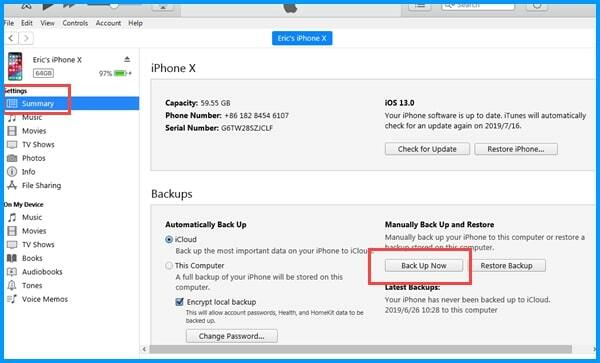 So, this iPhone to Mac backup guide with 3 methods will teach you how to backup iPhone to Mac safely and easily. How to Backup iPhone to Mac PC with Zero Data Loss? With DearMob iPhone Manager, there is no need to worry about iPhone data loss. It helps you backup iPhone, iPad and iPod to Mac/PC in zero effort. With one click, you are allowed to batch transfer iPhone data to Mac/PC completely or selectively backup iPhone contacts, messages, photos, notes, videos, etc to computer. Method 1. Backup iPhone to macOS Mojave with DearMob iPhone Manager? DearMob iPhone Manager is a professional iPhone backup software capable of backing up data from iPhone, iPad, iPod to Mac and PC completely in a matter of minutes. Compatible with 12 types of iOS data including Photo, Music, Video, Book, Voice Memo, Calendar, App, Bookmark, SMS, Contact and DRM content, this iPhone to Mac backup tool offers you enough freedom to transfer anything important to you to Mac and PC computer safely. Step 1. Download, install DearMob iPhone Manager on your Mac and launch it. Step 2. Connect your iPhone to Mac with USB cable, then this iPhone to Mac backup tool will automatically detect your device. If this is your first time to connect your iPhone to computer, there would be message popping up on your iPhone and you should tap Trust This Computer to continue. Step 3. Clik "Backup" button to backup iPhone to Mac. When you access the backup window, you can see three options. 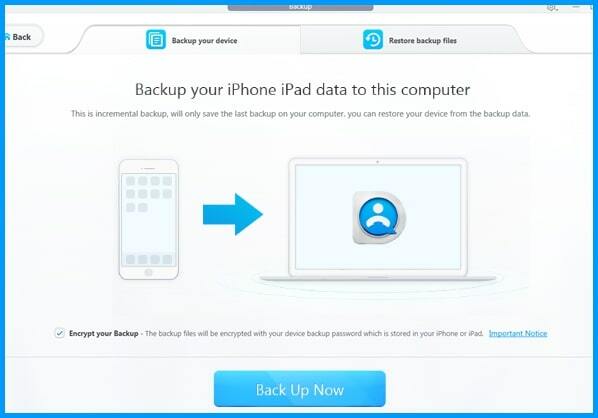 Backup Now part allows you to backup everything from iPhone to Mac, and Restore part can restore iPhone without iTunes: the data you backed up in advance. Step 4. Just click "Backup Now" to backup all data from iPhone to Mac. Notice: Once you connect your iPhone to Mac, you will see there are another 12 options on the UI of DearMob iPhone Manager. If you want to manage specific type of your iPhone data, you can selectively try each one of them. Besides, you are allowed to find everything you backed up on computer with this iPhone to Mac backup software. iTunes is the native backup tool for iPhone, iPad, iPod that Apple encourages for iOS device backup to Mac or PC. It's free and traditional but quite slow in interface and complicated in operation. In terms of iPhone to Mac backup, you have to turn off iCloud first on iPhone before backup. And Apple ID with the right passcode is necessary to enable devices. Step 1: Turn off iCould. Go to Settings –> iCloud -> Storage & Backup -> turn off the iCloud Backup switch. Step 2. Open iTunes and connect your iPhone to Mac with USB cable. Step 3. Once connected, you will see your iPhone's name in the menu bar and select your iPhone. Step 4. Click Back Up Now to manually backup iPhone to Mac. On the left side of Back Up Now button, there is a Automatically Back Up option where you can click "This computer" to create a new and locally stored backup immediately each time you connect your iPhone to Mac. Notice: After the backup process, you can see if your backup finished successfully in iTunes Preferences -> Devices. But, unfortunately you would not able to view the iTunes backup files on Mac. If you want to backup Health and Activity data from your iPhone, iPad, iPod or Apple Watch, you have to encrypt your backup: Select Encrypt backup box and then create a password. iCloud is Apple's second backup method for iPhone, iPad and iPod in conjunction with iTunes. iCloud backup includes nearly all data and settings stored on your device, like bookmarks, contacts, calendars, notes, etc. Specifically, this iPhone to Mac backup tool is easy to set up and they will automatically run in the background when your iPhone is plugged in or on a WiFi connection. However, you are asked to log in with iCloud account to access the first step to backup iPhone to Mac. Besides, only 5GB storage space is free and you have to pay at least $0.99 to extend the storage capacity for storing more data, otherwise the iCloud backup could not be completed. Step 2. Go to Settings -> tap your name -> tap iCloud. If you're using iOS 10.2 or earlier, go to Settings, then scroll down and tap iCloud. Step 3. Tap iCloud Backup and make sure that iCloud Backup is turned on. Notice: If you want to make sure the backup is completed, you can: Go to Settings > [your name] > iCloud > iCloud Storage > Manage Storage, then select your device to see the details with the time and backup size. It depends on your preference to choose the method to backup iPhone to Mac, but DearMob iPhone Manager is the one deserving your trial. It is a great iPhone Manager for you to visibly handle your iPhone files, say backup iPhone text messages, notes, contacts, photos, music, etc. More specifically, you are allowed to delete unwanted iPhone songs, export text messages, make ringtones for iPhone, edit file information and more. Besides backup, there are more for you to explore.